Chicken thighs are pretty much a staple in our house when it comes to dinners. They have great flavor, are versatile and are almost always on sale somewhere. You can get them as they are or boneless and skinless (though they are very easy to bone and remove the skin and can save you money if you just buy them as is) and can use them in nearly any way. They make a great substitute for the typical boneless chicken breasts that you see, cost less and, in my opinion, taste better. I always have some in the freezer available to use for a dinner and this particular dinner, from Cook’s Country, was the one I chose to make. It is for pan-seared chicken thighs with potatoes and chorizo so you get a great mix of flavors here. Adjust an oven rack to the middle position and heat the oven to 375 degrees. Pat the chicken dry with paper towels and then season the chicken with salt and pepper. Heat the olive oil in a large nonstick skillet set over medium-high heat until the oil is just smoking. Add the chicken pieces, skin side down, and cook until the skin is well-browned, about 7 to 10 minutes. Transfer the chicken, skin side up, to a rimmed baking sheet and roast the chicken until the meat registers 175 degrees on instant-read thermometer inserted into one of the chicken pieces, about 15 to 20 minutes. Meanwhile, add the potatoes to the now-empty skillet and cook, covered, over medium heat until lightly browned, about 5 minutes. Add the chorizo and cook, uncovered, until the potatoes are tender, about 5 minutes longer. Add the spinach and cook until the spinach is just wilted and the liquid has evaporated, about 2 minutes. Serve the chicken with the potato mixture, sprinkled with the smoked paprika. You have plenty of options here if you want to change things up along the way. If you and your family prefer white meat you could always substitute boneless chicken breasts or even bone-in chicken breasts. Just adjust the time accordingly so that the chicken is cooked through and not dry. If you prefer a milder sausage, you could always use Italian sausage or even kielbasa with this dish instead, though I liked the spice the chorizo added to the dish with the potatoes. I served the spinach on the side instead of putting it right into the dish with the potatoes, but you could certainly do either. In the end, you end up with some nice crispy chicken pieces that blend well with the potatoes, chorizo and spinach and you get to make a meal that only takes about 30 minutes to do. That’s all I have for today. Check back next time for another new recipe to try. until then, enjoy the rest of your day and enjoy your meal! It doesn’t seem like it could actually get much colder or more miserable around this winter and February has only just begun. We have had enough snow already with more in the forecast for this week to go along with pretty frigid temperatures pretty much every day of the week for the last two weeks. When the weather gets like this, the thoughts of cooking meals, for me at least, turn to things that are warm, rustic and comforting. You want a meal that is going to make you feel warm all over when you eat it. This is the time of year when things like stews and soups are great, and this particular recipe turned out to be somewhat like a stew. 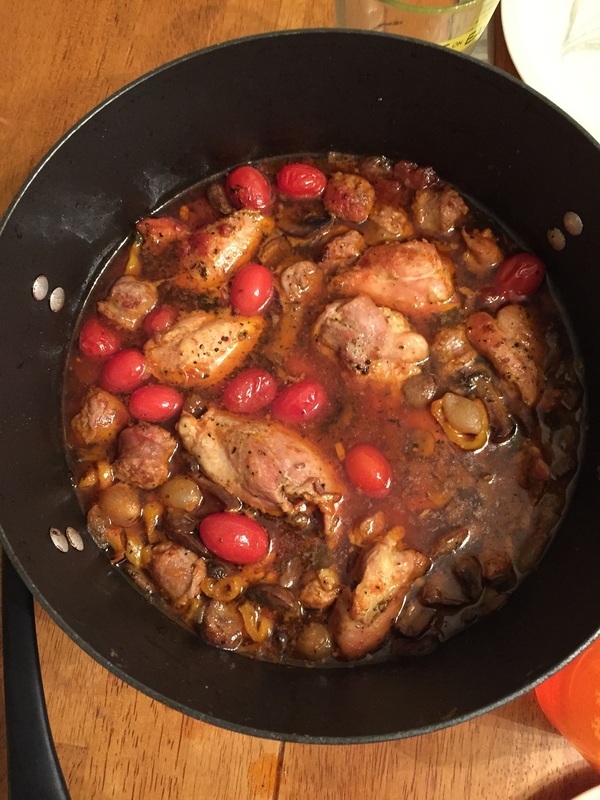 I had seen the recipe from Guy Fieri on the Food Network not long ago and it made use of some of the basics around the house to produce a nice chicken thigh and sausage cacciatore so I thought I would give it a try. Preheat the oven to 350 degrees. Add the olive oil to a large Dutch oven set over medium-high heat and add the sausage pieces, searing them until they are browned all over, about 3 to 4 minutes. Remove the sausages to a plate and set them aside. Sprinkle the chicken thighs on both sides with salt and pepper, then sear the chicken in the Dutch oven, 4 to 5 minutes per side. Remove the chicken thighs to a plate and set it aside. Add the mushrooms, pearl onions, red peppers, roasted garlic and the red pepper flakes to the pot and season them with salt and pepper. Saute the mixture until the vegetables are softened and the pearl onions become translucent, about 4 minutes. Add the red wine and bring the mixture to a boil, and then simmer for 5 minutes, deglazing the pan and scraping up any bits on the bottom of the pan. In a large roasting pan add the browned sausages and the chicken thighs, the sautéed vegetables and the chicken stock and marinara sauce. Tie the thyme and rosemary into a bundle using butcher’s twine or kitchen twine and add it to the pan. Stir all of the ingredients together and transfer the roasting pan to the oven. 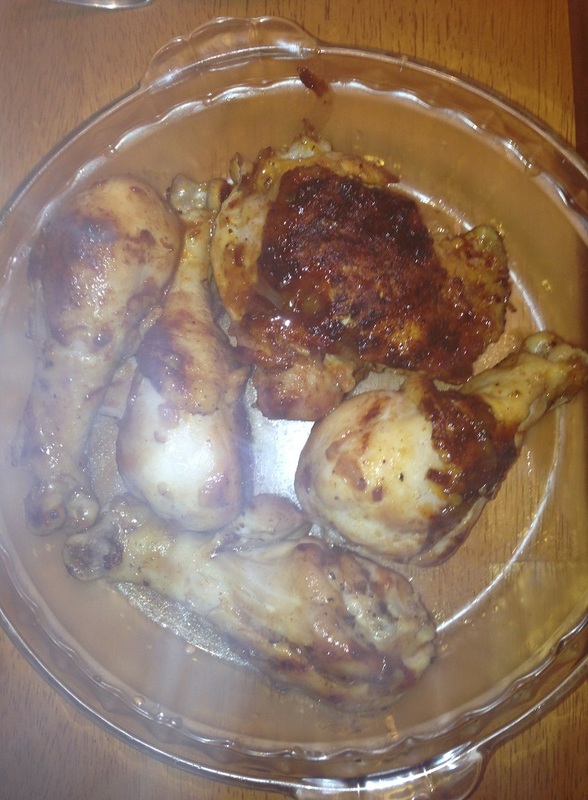 Cook until the chicken thighs are cooked through and tender and the sauce has thickened, about 35 to 45 minutes. Remove the herb bundle and serve the cacciatore on a large serving platter, garnished with the parsley. I did make a couple of changes to the recipe as I went along. I removed the skin from the chicken thighs as I thought it would get flabby during the cooking even after searing it and there was already enough fat in the dish from the sausage. I also used a mix of different colored peppers, using red, yellow and orange peppers. Finally I added some grape tomatoes along with the marinara sauce to give the dish a little more flair and fresh flavor. I loved the mix of the chicken and sausage and all of the vegetables together and I served this over rice and it was delicious. I think you could also serve this with pasta, noodles or even a risotto and it would be just as good and the leftovers tasted even better the next day for lunch with the flavors having a chance to meld even more. I’ve been working pretty hard the last few days and I haven’t had much time to blog so I will try to get to it early today so I can get a recipe up. I have made a bunch of different things over the last few weeks that I hope to get up here, including some different chicken dishes that give you a little something different to do with a tasty and more inexpensive option for your meal. To me chicken thighs are the best part of the chicken and even more versatile than the famous boneless chicken breast. 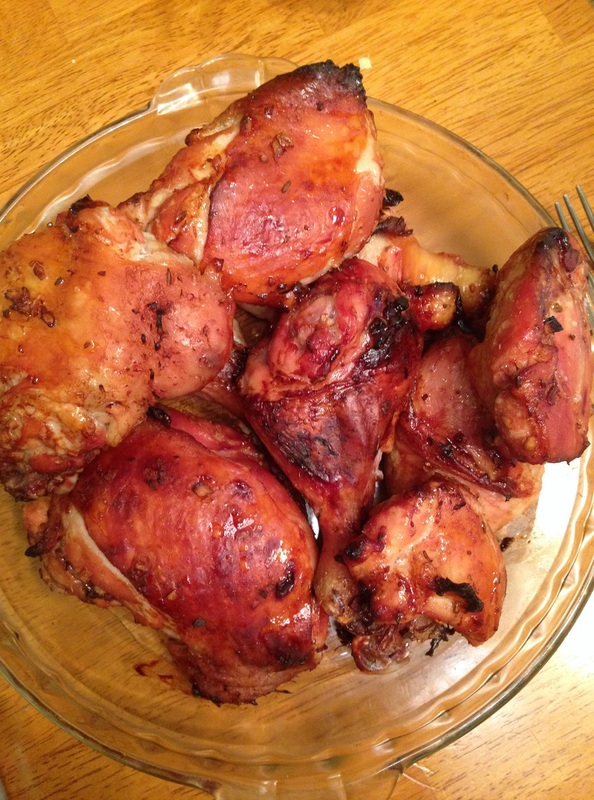 You get much more flavor from the thighs and you can buy them boneless and skinless if you choose, though you get even more flavor from the boned version and you can easily remove the skin and bones on your own if you life and chicken thighs are very affordable. Most of the time I get them for about 99 cents a pound so you can do really well with them. This particular recipe I tried, from Williams-Sonoma. is a simple herbed chicken thigh recipe that you can do in the slow cooker with a warm zesty potato salad as a nice side dish. For the chicken, pat the chicken thighs dry and season them generously all over with salt and pepper. In a large, heavy frying pan over medium-high heat, warm the olive oil. When the oil is hot, working in batches to avoid crowding in the pan, add the chicken, skin side down, and sear until the chicken pieces are a golden brown, about 4 to 5 minutes. Do not turn the chicken. Transfer the chicken to paper towels briefly to drain then transfer the chicken thighs to the slow cooker. Add the onion, garlic, thyme and oregano and bay leaves to the same frying pan used for the chicken and saute everything over medium-high heat until the vegetables are just beginning to color, about 5 minutes. Pour in the wine and the white wine vinegar and stir the pan to scrape up and browned bits on the bottom of the pan. Stir in the chicken broth, 1/2 teaspoon of salt and several grinds of black pepper, then pour the contents of the frying pan over the chicken in the slow cooker. Cover the slow cooker and cook in the low setting for 4 hours until the chicken is very tender. About 30 minutes before the chicken is done, make the potato salad. In a small bowl, whisk together the Dijon mustard, shallot, red wine vinegar, 1/4 teaspoon of salt and a few grinds of black pepper. Whisk in the olive oil until it has emulsified. Set the dressing aside. Quarter the red potatoes and place them in a large saucepan with salted water to cover. Bring the potatoes to a gentle boil over medium-high heat and cook, uncovered, until the potatoes are just tender, about 8 minutes. Drain and transfer the potatoes to a serving bowl, drizzle the potatoes with about 1/3 cup of the vinaigrette and toss to coat the potatoes. Taste the potato salad and more of the remaining vinaigrette if desired. Let the potato salad cool slightly, then add the cherry tomatoes and oregano. Toss the salad to combine everything. When the chicken is done, transfer the chicken to a plate and keep it warm. Remove and discard the bay leaves and the thyme and oregano sprigs. Let the braising liquid stand for a few minutes then skim off the fat with a large spoon. Divide the chicken thighs among warm individual plates and drizzle the chicken with some of the braising liquid. Mound the potato salad alongside the chicken and serve. 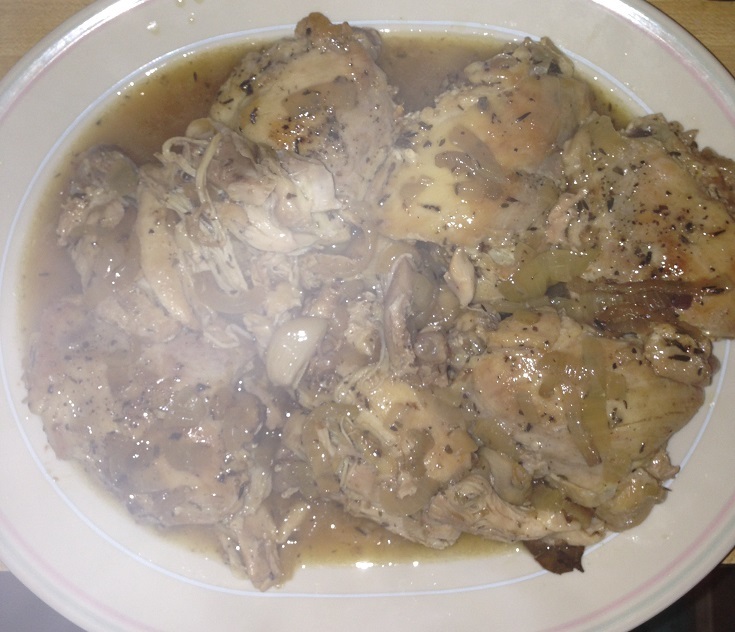 It is a very easy meal to put together thanks to the slow cooker and you end up with very tender chicken that has great flavor from the braising liquid. 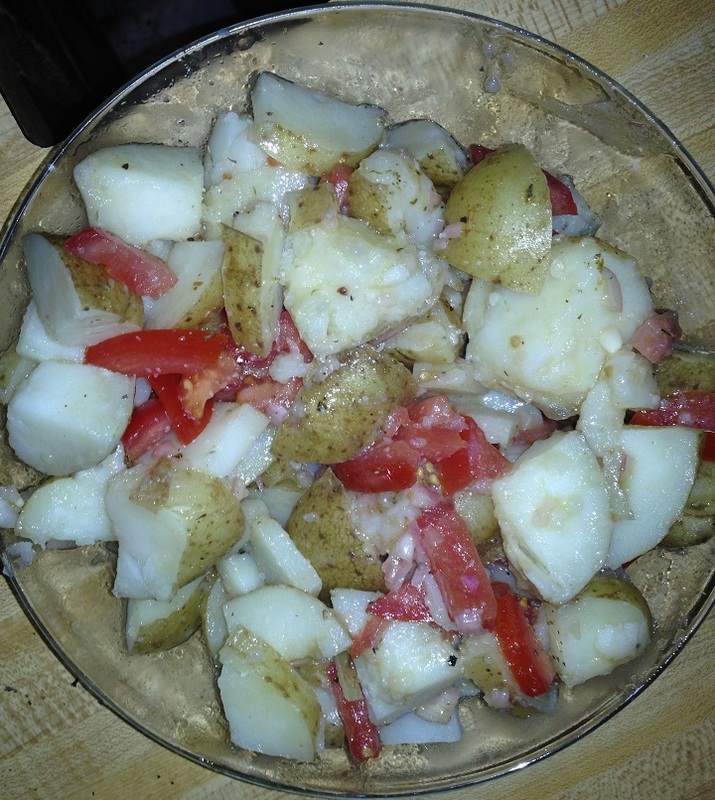 It pairs very nicely with the zesty potato salad, which has some nice zing from the mustard and red wine vinegar and the tomatoes add a nice touch to the salad. The chicken was even better the next day as a leftover for lunch when the flavors had a chance to meld even more. I have made a lot of chicken lately because it has been on sale a lot around here and quite frankly right now it is one of the most affordable meats for a family. All it takes is a simple trip to the grocery store lately to see that the price of just about everything has gone up lately, causing most people’s food bills to skyrocket and bust your budget. That is why I look for the best deals I can find and go to BJ’s Warehouse to buy some meat where I can things at bulk for a good price for many meals. This was the case recently when I bought big packages of chicken thighs, breasts and drumsticks and portioned them out into the freezer, cramming it full of chicken for the foreseeable future. Now the trick will be just what to do with all of that chicken. I decided to make some drumsticks and thighs the other day and saw this easy recipe from Sunny Anderson on the Food Network for a simple, sweet glazed chicken. While she used a whole chicken on the grill and butterflied it, I opted to just use chicken pieces and my grill pan as an alternative. I’ll post the original recipe here, but I’ll also tell you how I adapted it for my needs. For the chicken, season the chicken generously with salt and pepper all over. Rest the chicken on the counter, covered, until the chicken comes to room temperature, about 2 hours. Preheat a grill to 400 degrees. Lightly oil the grill grates with canola or vegetable oil. Grill the chicken over indirect heat, rotating the chicken occasionally,until the internal temperature of the chicken registers 165 degrees on an instant-read thermometer, about 50 to 60 minutes. For the glaze, while chicken is grilling, melt the butter in a small saucepan. Add the grated onion, the allspice, a pinch of kosher salt and a pinch of black pepper. Cook the mixture until the onions are tender, then add the grated garlic and cook until it is tender but not browned. Add the brown sugar, the stone-ground mustard, the cider vinegar and the hot sauce. Cook the mixture until it has begun to reduce and thicken, about 5 minutes, then remove the glaze from the heat. When the chicken is nearly cooked through, brush on the glaze. Cover he grill and continue to cook the chicken until the glaze begins to color and the chicken is done. Cover the chicken loosely with foil and allow it to rest for 15 minutes to allow the juices to redistribute in the chicken. Cut the chicken into sections and serve. Since I decided to just make chicken pieces and use the grill pan inside, I cooked the chicken in the grill pan over medium-high heat until it was browned on all sides and got some grill marks on it. I also made the glaze as directed and then put the glaze on the chicken pieces and then put the whole pan in a 400 degree oven to finish cooking. This allowed me to get the crispy skin, a nice glaze and I still had the grill marks as if it was grilled. The glaze had just the right amount of sweet to it from the brown sugar and nice flavor from the allspice to make it a little different from other glazes you might try. It was certainly easy to put together and we all enjoyed the chicken pieces with some sweet potatoes and green beans. In keeping up with the trend of a number of the chicken recipes that I have tried lately, this one was one of my personal favorites. I had seen this recipe in the last issue of Bon Appetit magazine and it sounded so delicious and made use of some great ingredients that I absolutely had to give it a try. While the original recipe calls for just using chicken thighs, I had a mix of thighs and drumsticks available to use so I made a little bit of both for us to have for dinner that night. This recipe for sot-glazed chicken with asparagus and scallions is easy enough to make for a weeknight meal and elegant enough for whenever you might be entertaining or want a meal that looks as great as it tastes. Toast the aniseed in a small dry skillet over medium heat, tossing frequently and watching to make sure it does not burn, until the aniseed is fragrant, about 2 minutes. Let the aniseed cool and then finely chop it. Whisk the garlic, lime juice, soy sauce, honey and the chopped aniseed together in a large bowl. Add the chicken pieces and toss the mixture to coat the chicken well. Allow the chicken to sit in the marinade for at least 30 minutes. Preheat the oven to 450 degrees. Transfer the chicken and the marinade to a foil-lined, rimmed baking sheet, making sure to place the chicken skin side down on the foil. Roast the chicken until the fat begins to render, about 15 to 20 minutes. Turn the chicken skin side up and continue to roast it, basting the chicken occasionally with the pan drippings, until the chicken is cooked through and deeply browned, about 15 to 20 minutes longer. After turning the chicken, toss the asparagus and the scallions with the vegetable oil on another rimmed baking sheet. Season the vegetables with salt and pepper. Roast the vegetables, shaking the pan about halfway through the cooking process, until the vegetables are tender, about 10 to 15 minutes. If you have thinner stalks of asparagus or scallions, they will cook more quickly and will be done faster. Transfer the chicken to a platter. Pour any pan juices into a glass measuring cup. Let the juices sit for a few minutes and then spoon the fat from the surface of the juices. Spoon the pan juices over the chicken and serve the chicken with the asparagus, scallions, cilantro and lime wedges. You can always begin marinating the chicken a day ahead and simply cover the bowl and store it in the refrigerator until the next day if you want even deeper flavors. I did not have aniseed on hand but substituted fennel seed instead and got that licorice flavor that you get from either herb, so I think it worked well.The marinade is wonderful and imparts incredible flavor to the chicken thanks to the combination of the soy sauce, honey, aniseed and lime juice. 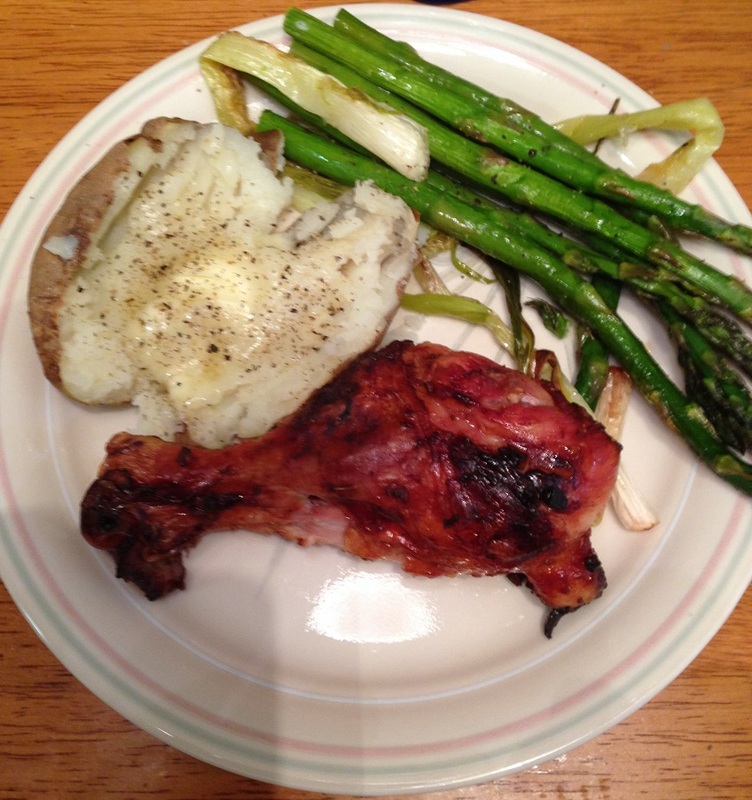 I love roasted asparagus as well and with the scallions together they just seem to go really well with the chicken. It’s a great dinner that you can do in just over an hour and you get this deep brown chicken with amazing flavor and the house smells great while it is cooking. With the prices of just about everything else going up at the grocery stores, chicken is one of the few things that has remained reasonable for some of the pieces. Boneless chicken breasts remain high-priced, in my opinion, but you can get legs and thighs for a very good price, bone-in breasts are reasonable, and you can always get a whole chicken and cut it up yourself to get several meals out of it and then some stock as well. In any case, I have been stocking up on legs and thighs lately so I have also been scouring around looking for new recipes to try to get some different tastes and flavors so it doesn’t seem like we are eating the same thing several times a week. I cam across this recipe on the Internet not long ago from The Beeroness for a honey chili beer chicken that looked great, so I thought I would give it a try. In a cast iron skillet over medium heat, add the olive oil and heat until the oil is shimmering. Add the onions and caramelize the onions over medium heat, mixing occasionally, until the onions are a nice golden brown, about 10 to 15 minutes. Stir in the garlic and then add 1/2 cup of the brown ale, the balsamic vinegar, the honey and the chili sauce. Simmer the mixture until it is reduced and thickened, about 3 to 5 minutes. Remove the sauce from the pan and set the sauce aside. Sprinkle the chicken thighs on all sides with the salt, pepper and all-purpose flour to coat the thighs well. 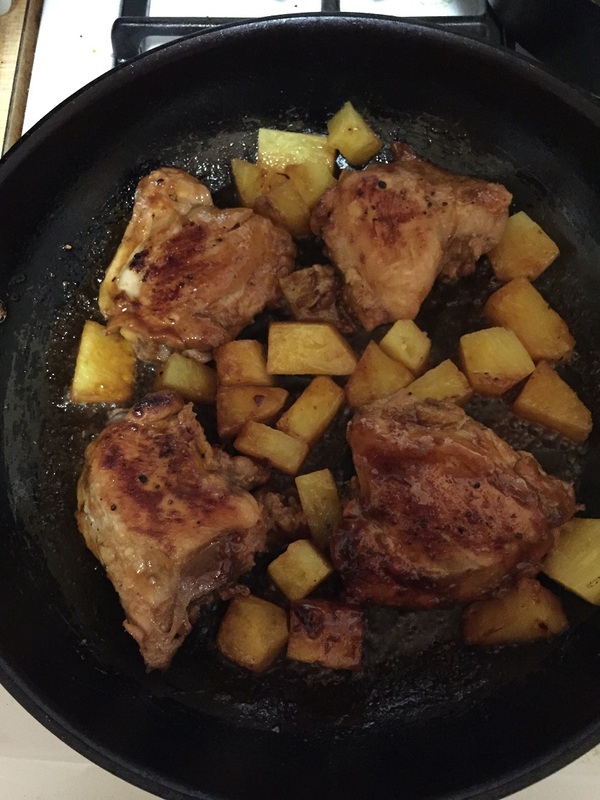 Increase the heat of the stovetop to medium-high, place the chicken thighs in the now-empty cast iron skillet and cook the chicken thighs until they are browned on all sides, about 3 minutes per side. 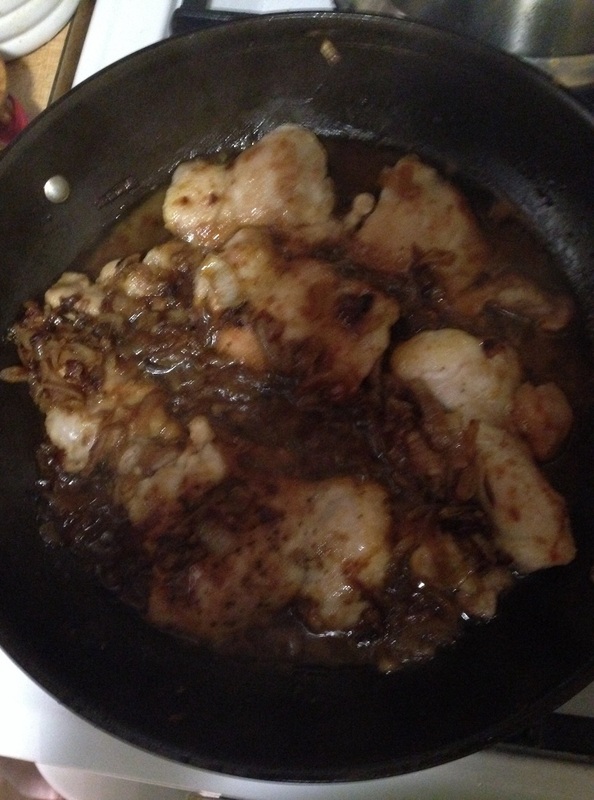 Pour the sauce back into the cast iron skillet with the chicken along with the remaining 1/2 cup of the brown ale. Cover the skillet loosely with a lid, lower the heat of the stovetop to maintain a simmer in the skillet and allow the chicken to cook until the chicken thighs are cooked through, about 10 to 12 minutes, turning the chicken once during the cooking process. Remove the chicken and sauce to a platter and serve. The sauce that you make with this chicken is really good. You get a great combination of flavors from the brown ale, the balsamic and the honey and a little bit of heat from the chili sauce to round it all out. Add in the sweetness of the caramelized onions and it seems just perfect. I am sure you could do this meal with boneless chicken breasts if you wanted to or even just make the sauce to use over something like chicken wings or drumsticks and get the same great results. 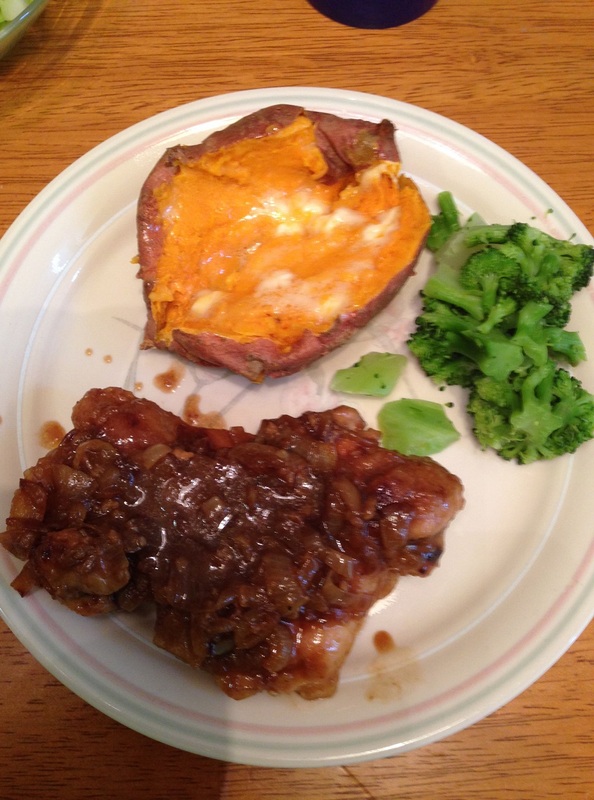 The sauce might even go well with some pork chops if you wanted to give that a try as well. It was a quick, easy way to make good use of chicken and gives you some great options when you are looking for something different to try for your meal. I used a lighter ale than the recipe called for, Smithwick’s, because that is what I had on hand, but I think you could use just about any type of ale and it would work well here. That’s all I have for today. Check back next time for another recipe. I have lots of things I have tried lately, including a bunch of chicken recipes, and I just got the latest issue of Cook’s Country (my personal favorite cooking magazine) and it has some great chicken recipes to try along with some other great options, so I will be giving a bunch of those a shot as well. until next time, enjoy the rest of your day and enjoy your meal!